Roentgen’s discovery of x-rays in 1895 began the rapidly expanding uses of radiation and radioactivity in medicine. Becquerel discovered radioactivity the following year, and Marie Curie coined the term “radioactivity” shortly thereafter. These pioneers laid the groundwork for scientific principles we now take for granted, such as atomic structure. The first few decades of the twentieth century were a hotbed of discoveries, including artificial radioactivity by Irène and Frédéric Joliot-Curie and the invention of the cyclotron by Lawrence, leading to the production of radionuclides for medical applications (e.g. I-131, Tc-99m). 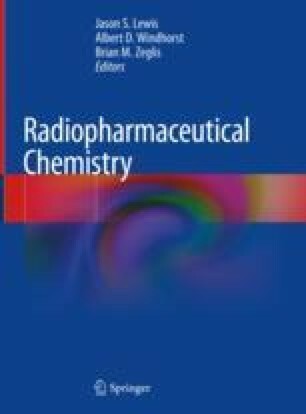 de Hevesy presented the “radiotracer principle,” which states that radiopharmaceuticals can participate in biological processes but do not alter or perturb them. Kamon and Rubin’s discovery of carbon-14 was critical for its role in life science research. After World War II, nuclear science research used for destruction was quickly channeled for medicine. Iodine-131 was successfully applied to treating Graves’ disease and thyroid cancer. The Mo-99/Tc-99m generator was developed by scientists at Brookhaven National Laboratory. The invention of the gamma camera, single-photon emission computed tomography (SPECT), and positron emission tomography (PET) instrumentation boomed during the 1950s through the 1970s. Fluorine-18-labeled 2-deoxy-2-[18F]fluoro-D-glucose (or [18F]FDG) was approved by the US Food and Drug Administration (FDA) in 1999 and is now the primary tracer for PET scans throughout the world. Novel research in developing instrumentation, radionuclide production, radiochemistry strategies, and radiotracers continues in the quest to improve human health. The Nobel Prize in Chemistry 1935. Nobelprize.org. Nobel Media AB 2014. http://www.nobelprize.org/nobel_prizes/chemistry/laureates/1935/. Accessed 4 June 2018. The Nobel Prize in Physics 1939. Nobelprize.org. Nobel Media AB 2014. http://www.nobelprize.org/nobel_prizes/physics/laureates/1939/. Accessed 4 June 2018. The Nobel Prize in Chemistry 1943. Nobelprize.org. Nobel Media AB 2014. http://www.nobelprize.org/nobel_prizes/chemistry/laureates/1943/. Accessed 4 June 2018. Abraham GE. The history of iodine in medicine Part II: Thyroid fixaion and medical iodophobia. Iodine Study # 16. Optimox. http://www.optimox.com/iodine-study-16. Accessed 8 July 2018. Tobias CA, Lawrence JH, Roughton FJW, Root WS, Gregersen MI. The elimination of carbon monoxide from the human body with reference to the possible conversion of CO to CO2. Am J Physiol. 1945;145(2):253–63. https://doi.org/10.1152/ajplegacy.1945.145.2.253.